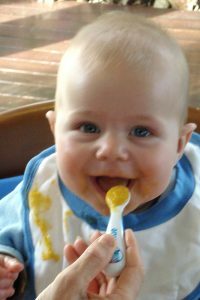 Yes I’ve written about protein here https://wellnourished.com.au/babies-first-foods/. Protein and iron are very important for growth and development and great first foods. I agree re- the standard ‘rice cereal’ rec’s. One of the many flaws in our industrialised food chain guidelines! Thanks for the great posts. It’s wonderful information when starting solids can be somewhat overwhelming! A quick question, when soaking the grains, how much whey or yoghurt do you add to the water? I don’t have a problem with a small amount of good quality yoghurt – organic, full-fat and unsweetened only is my preference. My Lunchbox ebook is food suitable from bubs to teens so it would be a great investment for you now. It has lots of great savoury cracker recipes which quite a few mums with babies have emailed their appreciation for. I’d stick with the savoury recipes for now. No use developing a sweet palate in little ones. Hi Georgia, my exclusively breastfed baby is 5.5 months old now and showing signs of food readiness. These posts are so helpful! I wanted to check whether you still suggest holding off on wheat until 12 months. We don’t each much wheat ourselves, but the latest evidence around allergy prevention suggests introducing allergens (wheat, seafood, nuts etc.) from six months. Do you agree with this, or would you still hold off on cooked egg white and wheat until 12 months? Thank you! Hi Georgia, so happy I’ve found your site as I’ve decided I’m going to take my 9 month old back to solids basics in hope It helps the eczema she’s developed since starting solids. So loving the look of the baby pumpkin risotto recipe and just wondered why do you soak the rice in whey? Could you use breastmilk instead? Thank you ???? Ah that’s great Katherine that you’ve found that – many little ones struggle with grain so definitely best to avoid in the early days as you’ve discovered. It’s really tough as a Naturopath to write on health ‘topics’ like eczema as the way I treat it, is very individual. 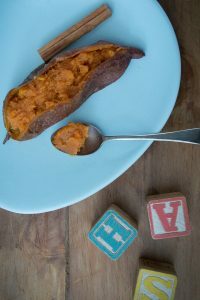 For most little ones, supporting their gut health is a priority (so take a look at all the posts I’ve written on digestion). Some kids need extra liver/ lymphatic or nervous system support (but again that is something I’d determine after a thorough consult). Thank you so much for this wonderful site, i get so much from your thoughts and recipes. Just a couple of questions…. when you soak the rice in yoghurt overnight is that lacto-fermentation? And another thing I’ve been meaning to ask: i read something a while back which cautioned about the possible high lead content in bone broth. Due to the build up of lead in animals bones on account of the pollution to which we’re all exposed…. have you heard about this, and do you have any thoughts on it? Thanks so much Georgia, that is a great relief. Sorry, a follow up re the lacto-fermentation – should it be in or out of the fridge overnight? Thank you so much for your wonderful website and recipes. I have been using it religiously for the last 18 months or more and have all of your e-books. My second daughter is 7 months old and has been trying solids since she was about 4 months old (she was grabbing at food and very interested when we ate!). She is doing really well and I have used your posts to guide what I have fed her. My first born wasn’t interested in food until she was 8 months old and used to frustrate me when we tried, so this time round I am really enjoying cooking for my second! However, I would love some more recipe ideas – do you have any suggestions for other cook books/authors that you would recommend? I do make combinations up but would love some other ideas, especially now she is getting older and we can perhaps branch out in the next few months. You’re very welcome Rebecca, thrilled you have found it useful. 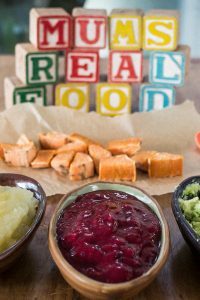 I tended to just mix lots of different flavours together when mine were little (comprised of the various foods I’d introduced individually) plus some finger foods (like steamed veggies that were were having as a family). Or I’d serve deconstructed versions of what we were eating. I’m not a fan of creating more work in the kitchen than necessary so I really don’t know of any ‘baby’ recipes. Jude Blereau has a great book ‘Wholefood for Children’ which does have a handful of baby recipes. Thanks Georgia – I’m notorious for over thinking things which I think I am in this regard (needing recipes) so yes will just keep to combining foods that she has tried. My Mum was just talking to me about that tonight…..!! I have Jude Blereau’s book and have been combining your information and hers so will continue to do so!